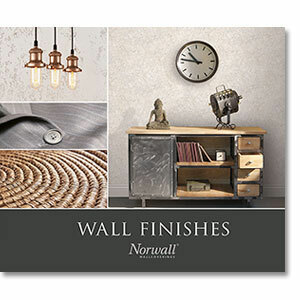 Wall Finishes has an exotic blend of warm and welcoming textures. Featured in this collection are highly realistic materials such as herringbone, metal screen, grass cloths, sisal, marbles, and weaves. Embossing patterns complement each of the designs to enhance the texture and movement within each print. With a warm and cool colour palette ranging from hues such as cool blues and warm pinks, milky whites and creams, natural beiges and browns, mineral greys and charcoal. There is something here for you to escape to nature within your home.